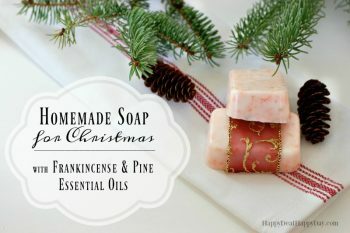 Easy Melt and Pour Soap Recipes for Christmas with Pine & Frankincense Essential Oils | Happy Deal - Happy Day! I cannot believe that we are in the middle of the fall season and that the hustle and bustle of the Christmas season is right around the corner! If you are like me and want to slow the hustle just a bit, then plan ahead now for your DIY Christmas gifts you plan on making. A super easy DIY gift idea is this homemade soap for Christmas recipe! **FYI on soap base quality is that it is worth it to pay a bit more and get a natural version – like the Our Earth’s Secret brand. The natural soaps melt better and feel better on your skin. I’ve tried cheaper and it’s just not worth the savings in my opinion. 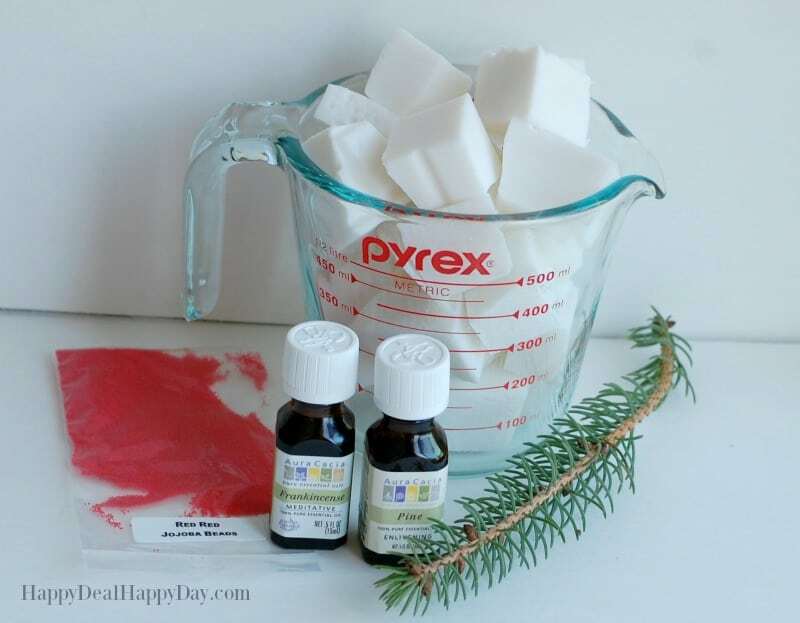 You need to start by cutting up half of your 2lb block of soap into cubes. 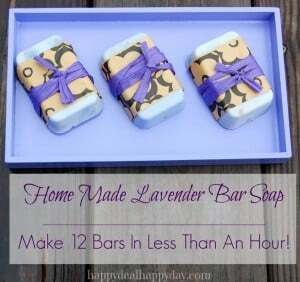 This soap is very easy to cut with a sharp knife. 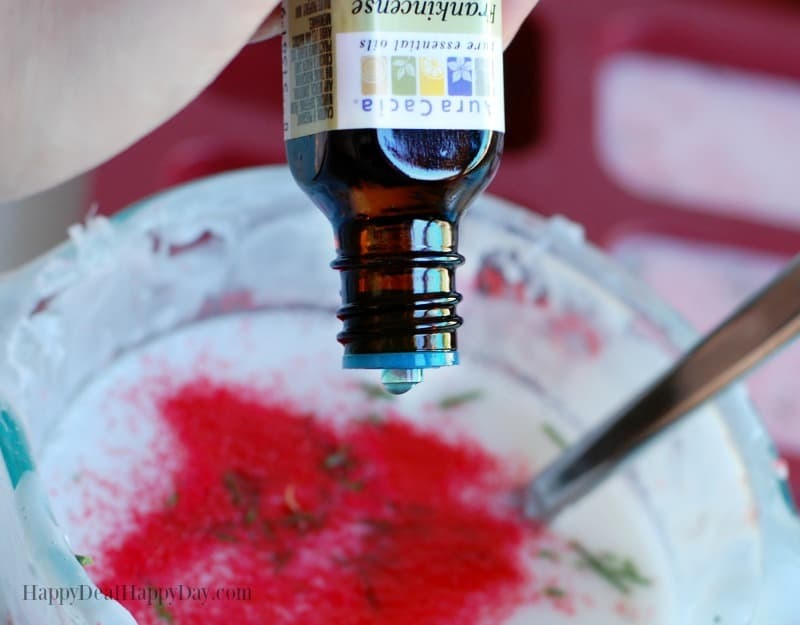 Place the cubes into your Pyrex measuring cup. I start with only half because only 1lb will fit in my Pyrex measuring cup at a time. 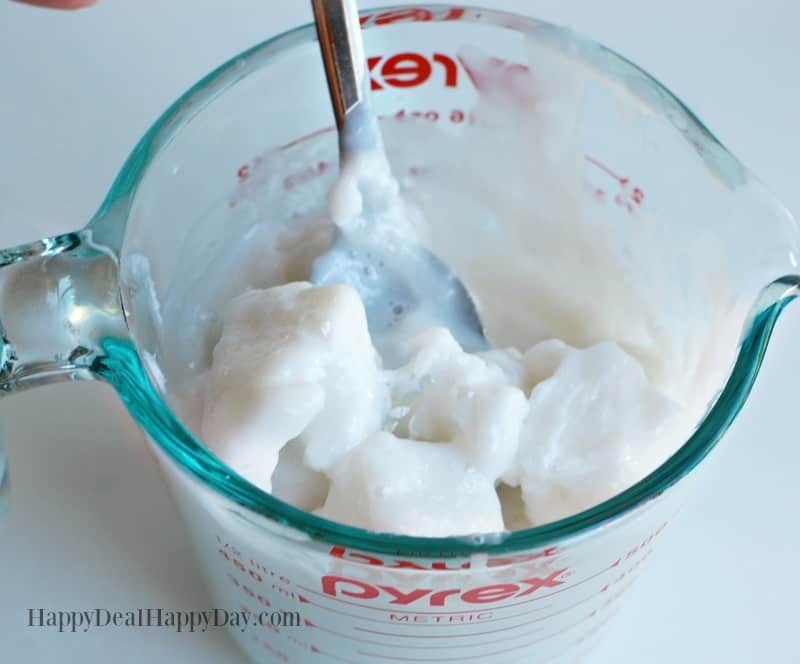 If you have a larger glass container, you can go ahead and melt your soap all in one batch. Microwave it in 30 second intervals, stirring each time. The picture above is what mine looked like after one minute. Continue heating and stirring until it is completely melted and smooth. It will be around 3 minutes. 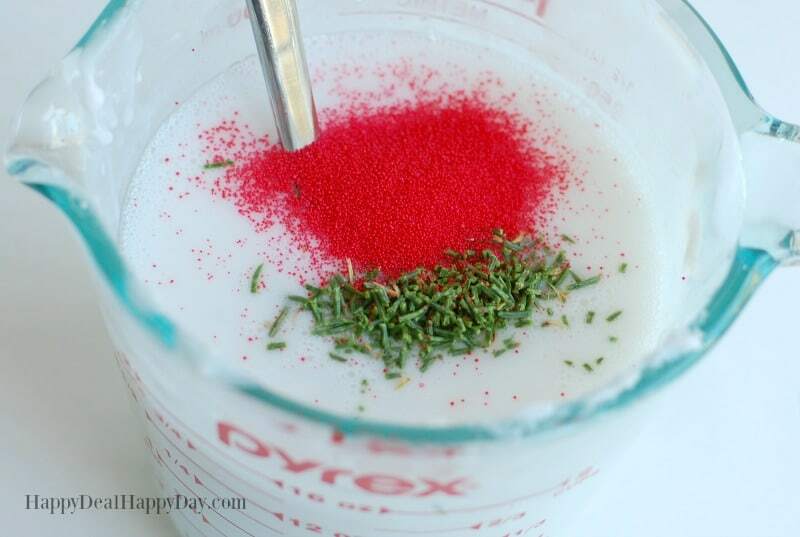 I wanted to add a bit of fresh pine needles to my soap for a bit of color, texture, and authentic pine scent. 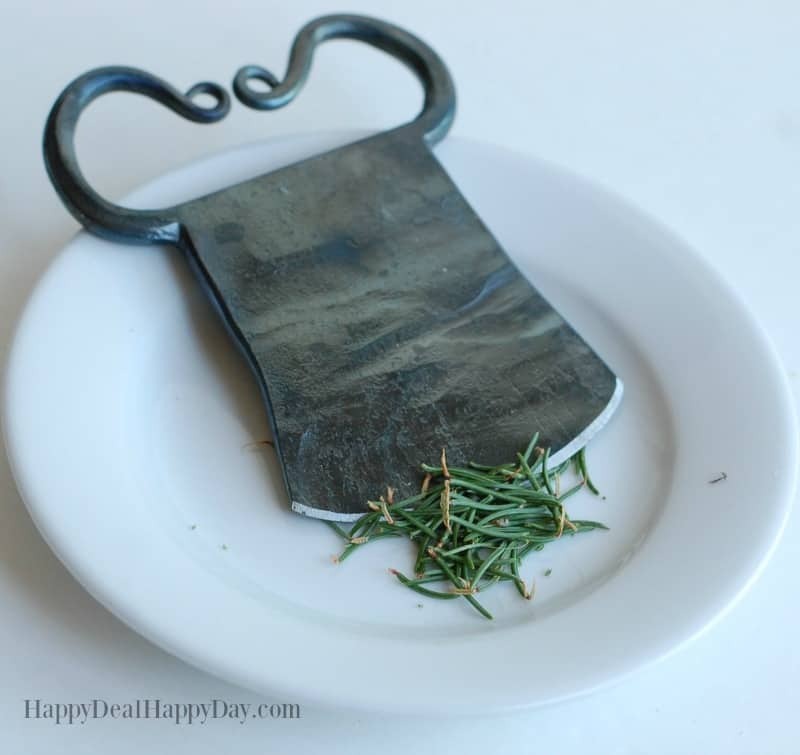 I have a heavy iron herb chopper that I used to cut up the pine needles. Here is a similar herb chopper that would probably work even better. 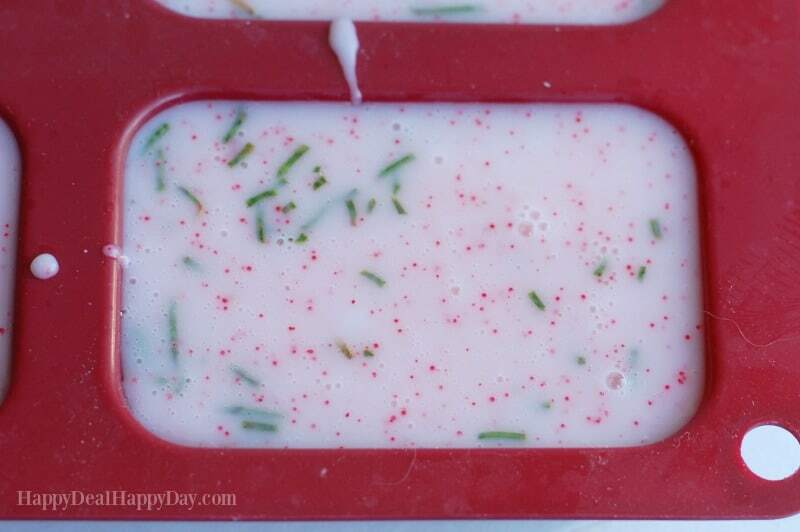 Add about 1 teaspoon of chopped pine needles and a tablespoon of red jojojaba beads to the melted soap base. 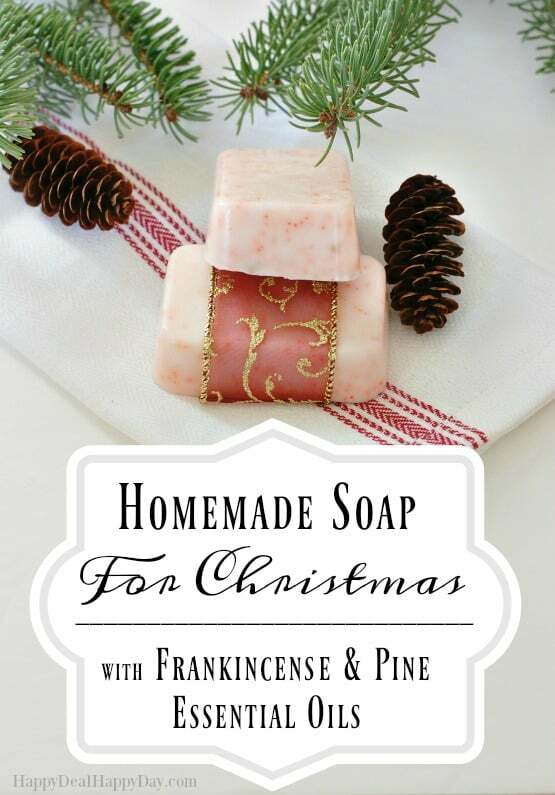 Then add 10-15 drops of both pine and frankincense essential oils. If you want a bolder scent, then I recommend doubling this amount. Stir that together briefly and pour the soap into the mold. If you let the jojoba beads sit too long in the hot soap, they will melt, so the sooner you pour and it starts to cool, the better. Let these bars sit for a few hours until they are completely cool before you pop them out of the mold. If you want to wrap them with these free printable paper wraps, fill out the form below to get the PDF e-mailed to you and you can print, cut, and wrap each bar with them! 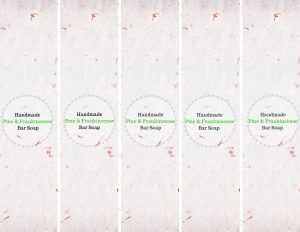 Subscribe to my weekly newsletter and you will get these soap labels delivered right to your inbox! Success! 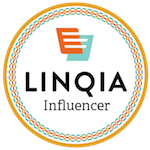 Now check your email to download and print your free soap labels. I wrapped mine in some Christmas ribbon as a nice finishing touch before I add them to a Christmas gift basket! 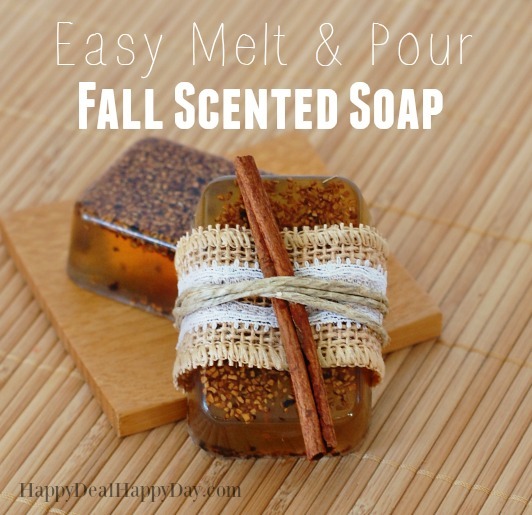 If you are looking for more soap making ideas – check out the Fall Scented soap, Lavender soap, and Lemon Poppy Seed soap recipes! 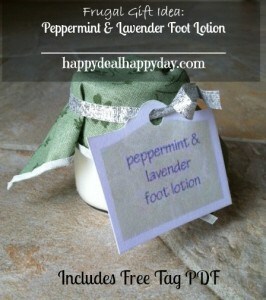 If you want some more DIY bath and beauty products to add to a possible gift basket – then check out this Peppermint & Lavender foot lotion! ← Free Printable DIY Rustic Christmas Ornaments! I guess I figured that the pictures were so helpful in the step by step process that I never considered a text only recipe. I will add that to my to-do list and update my soap posts. Thanks for sharing your feedback!